The Houston Rockets destroyed the Golden State Warriors in game 2 Wednesday night to even the series 1-1. The Rockets PJ Tucker had a playoff career high with 22 points and five 3-pointers. 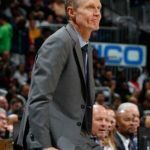 Warriors coach Steve Kerr was visibly upset with how his team played and said, “we got what we deserved”. Rockets 127, Warriors 105.